Parrish and Hobbs stand alongside "Dawn". 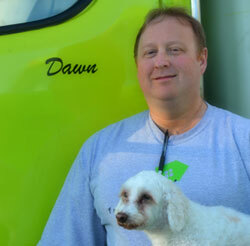 Dave, Francey and Parrish learned the moving industry from the ground up. In 1995 we were introduced to a moving franchise & spent the next 16 years absorbing everything about moving and more importantly – the values of customer service. We personally spent time packing houses, loading trucks, time with the customers, and time learning the business…..a lot of late nights and long weekends. We rode the highs of the housing boom and stayed lean during the economic downturns. We have moved small apartments and 10,000 square foot homes. And everything in between. We are respectful and appreciative of all the relationships we have groomed over the years with both customers and employees. 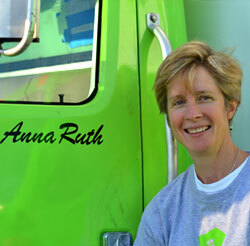 Francey standing beside "Anna Ruth"
In 2011 our team was given the opportunity to step away from the franchise umbrella and continue operating our moving company. We jumped at the chance and have not looked back. We know we have the support of over 30,000 previous customers that we have shared tears and laughter with. Don’t get Francey started with “moving stories”. One of the first things we did as Fantastic Moves... was to put our mother's name on the driver's door of each big moving truck. 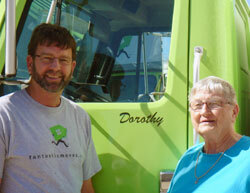 As we add to the fleet our Lead Drivers can have their own "Mom" Truck! We think it is kind of a big deal! !